Based on one of the most iconic figures of the 20th century, Marilyn Monroe is a glitzy, 5 reel, 20 payline video slot powered by Playtech. Top of the bill here is the Backstage Bonus feature where you can win up to 80 free spins with multipliers of between 2 and 10x. Play from between 20p and £1,000 per spin. 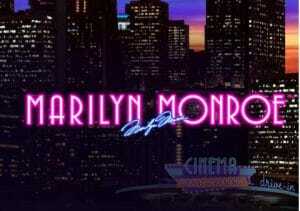 As you’d expect given that the subject matter is one of the biggest stars in movie history, the design here has a glossy feel – set against a skyscraper filled night sky, the reels include neon style playing card symbols as well as a movie camera, a pair of magazine covers, the Hollywood Walk star and Marilyn in red and white dresses. The laughing Marilyn is the game’s wild, replacing all other symbols apart from the scatter. This wild can appear stacked on all 5 reels, featuring Marilyn’s famous skirt blowing incident! All winning paylines that include the wild will see the payout doubled. 5 wilds in a row will get you a massive 10,000 coin payout. The Marilyn Monroe logo is the scatter – landing 3, 4 or 5 of them anywhere on the reels will trigger the Backstage Bonus feature – here you’ll start with 10 free spins with all payouts doubled. You’ll then be presented with a selection of 5 photos of Marilyn. Choose 2 of them to receive more free spins or multiplier prizes. These can reach up to 45 free spins with multipliers of 10x. Land 3 scatters during the feature and you can win another 35 free spins, all played out with the multiplier running. This means there’s a massive 80 free spins to be won. The Marilyn Monroe video slot may have a shiny feel but it’s also pretty volatile as the variance here is on the high side so expect plenty of spells when you won’t really trouble the cashier. The stacked wilds can certainly help but the real riches on offer come via the feature. Trigger a good number of free spins with a high multiplier and some great rewards can be won. This game may not quite be an A lister – it’s a stylish and entertaining affair though and well worth a spin whether or not you’re a fan of Marilyn. I also recommend Playtech’s Great Blue which is high variance and offers high multipliers in the free games feature.